Molly Bloom And Aaron Sorkin On The Real Story Behind 'Molly's Game' After a bad crash, Molly Bloom went from competitive skier to high-stakes poker game runner. "I was looking for this thing that would make me feel validated," she says. " ... And I sort of found it." 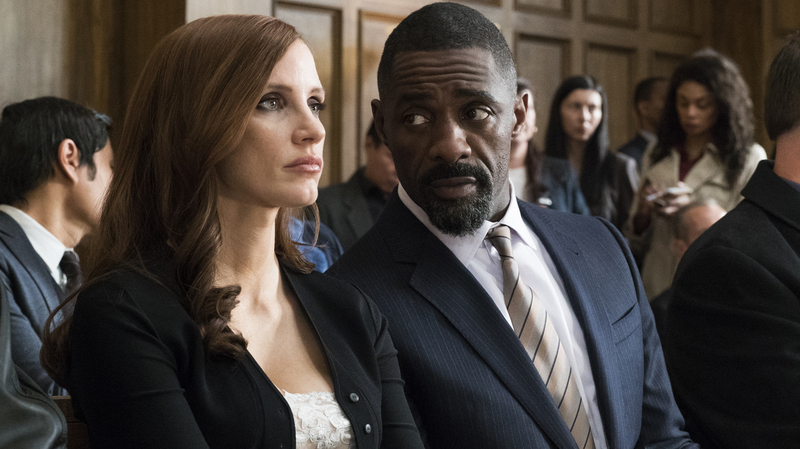 Jessica Chastain plays Molly Bloom and Idris Elba plays her attorney in Molly's Game. The film Molly's Game (up for two Golden Globes on Sunday) is based on a memoir by Molly Bloom, an Olympic-level skier whose athletic career ended in a dramatic wipe-out. While looking for something to occupy her time before law school, Bloom stumbled onto the world of underground, high-stakes celebrity poker. Eventually, she found herself in the sights of U.S. prosecutors, who targeted her for her role in organizing illegal games. They wanted to her to name the powerful men who played at her table — but she refused. Molly Bloom and Aaron Sorkin, the film's screenwriter and director, spoke to NPR's Michel Martin on Weekend All Things Considered. Sorkin said Molly's Game isn't actually about the glamour of high-stakes poker. "That was the back-drop for a much more personal, much more emotional and much more inspirational story." That story begins with Bloom finding her way to underground poker. She told Martin, "After I quit the U.S. Ski Team, there was a fair amount of, you know, grief that follows that, and I just wanted to take a year off. And I had a friend that lived in Los Angeles said I could crash on his couch. And so I just kind of did the first really spontaneous thing I'd done in my young adult life." Molly Bloom attends the New York premiere of Aaron Sorkin's Molly's Game on Dec. 13, 2017. Her parents cut her off, so she got a job helping out at a nightly poker game. "I saw some of the most famous people in today's world," she said. " ... I was a fly on the wall, and I'm privy to all this inside information about all these different industries. ... And at the end of the night, people were tipping me and I made more money that night than I'd made the whole month." Bloom grew up in a family of high achievers — one brother is a Harvard-educated cardiothoracic surgeon, and the other is a two-time Olympian. She said, "I was looking for this thing that would make me feel validated, make me feel like someone, make me feel significant. And I sort of found it." Eventually, Bloom went from working other people's games to starting her own – a leap that came with even more power and influence. "And then, ultimately, I started bankrolling the game and extending credit," she said. But Bloom had a complicated relationship with her players. She felt she was constantly coming up against their power, and said she grew tired of "oppressive men and having to play by their rules." Then the FBI stepped in and seized all her assets. According to Bloom, prosecutors offered to restore her accounts and even clear her record if she turned over the names of her players. But, she said, "I made these choices. ... To turn around when I was in trouble and take people down with me felt wrong." Bloom felt she could survive a couple years of jail if it came to that, but "stepping on other people and the sort of collateral damage to their families and everything — that felt like a life sentence." Aaron Sorkin described Molly's Game as "a story about decency." He said, "Molly was an honest-to-God, real-life movie heroine found in an unlikely place. ... This was a morality tale of doing the right thing when the wrong thing is easier." Alexi Horowitz-Ghazi and Natalie Winston produced and edited these interviews for broadcast.